Our conveniently sized, fully functional, durable and long lasting washcloths could make your life much easier. They are handy around the house, in the kitchen, bathroom, or garage. Throw some in the car or gym bag. Being that these are a 24 pack gives you many options. They are very durable, but also surprisingly soft. They are 100% Ring spun Cotton which does give them a soft yet crisp and clean feel. These washcloths are commercial grade, making them exceptional for hospitality industry. QUALITY: 100% Ring Spun Cotton is prime choice for quality. 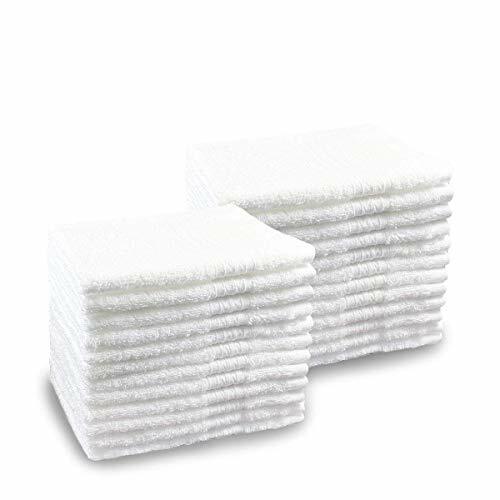 These lightweight washcloths are great for using around the house for general cleaning. Commercial grade quality ideal for hospitality industry. Each cloth measures 12" by 12"
BUYER BEWARE OF THE COUNTERFEIT SELLERS, Pacific Linens doing business as NEWGEN on Amazon is the only original seller of the item listed here but some unauthorized fake dealers are trying to sell their fake products as Pacific Linens products. Any one buying this product from any sellers other than Pacific Linens will not get original products listed here. If you have any questions about this product by Pacific Linens, contact us by completing and submitting the form below. If you are looking for a specif part number, please include it with your message.